I’m sitting in my home office today as my bathroom, kitchen and hallway are being ripped down to the studs. It’s stressful and the one thing that is keeping me from flinging myself from my second-story window is the contractor and his staff. No, really. Alexandre is polite and personable, uses his iPhone with brio and answers email promptly. His original timeline estimate has so far been accurate and his juggling of staff an efficient ballet. His advice regarding our 100-year-old house has been sound, even when we encounter problems and issues he’s never seen. He is good at working within budgetary constraints and managing these against the never-ending needs of an old house. Let’s say you ask a math teacher (and I have!) to describe their best student – we’ll call her Ella. He or she will tell you about how Ella is really good at using the information given to her to solve problems she has never encountered. He or she will also wax lyrical about Ella’s ability to accurately gauge her own strengths and weaknesses, and to ask people around her for help when needed. The teacher might also point out that Ella is really good in a group setting and can communicate her knowledge of mathematics clearly and effectively. I would also be willing to bet that Ella always has her math binder, math book, pencil and graphing calculator with her. Our hypothetical math teacher would probably not get excited about Ella’s ability to find the x and y variables in an algebraic equation, nor would he or she only talk about the precision with which Ella doubtless renders angles. So what do Alexandre the contractor and Ella have in common? Well, they both manage to effectively mobilize (a word all our own!) their Cross-Curricular Competencies! Remember those? They are there, in our Quebec Education Programme, forlorn and sheepish, swept away and diminished by forces other than pedagogical ones. True, they have been granted special asylum in the form of a sub-set of their number, and given some consideration in reporting. However, important as they are to real life success, they have been given second-class status as teachers and schools struggle to make sense of newer official documents. 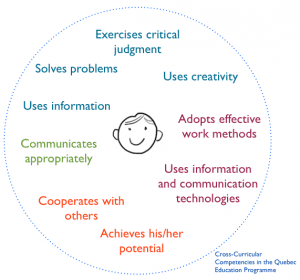 The Cross-Curricular Competencies (CCCs), as they were originally written into the QEP, are meant to contribute to the creation of life-long learners, who would then be able to navigate complexity and contribute to society while leading fulfilling lives. Now that’s a mission that a school could sink its teeth into, and one that would redefine success as being about life and not just about school. Instead, teachers were asked first to embrace a reformed curriculum (and they did!) and then to turn on a dime and quickly move in a different direction with report cards at odds with the ethos of the QEP, new evaluation frameworks and itemized lists of ‘learnings’. Back in the 1990’s, the Conference Board of Canada came out with a series of employability skills. Now before you go all “no way we’re teaching kids to work for the MAN”, know that these employability skills were designed for anyone entering the world of work, whether it is an entrepreneur, an employee or an autonomous worker. These employability skills mirrored closely our CCCs. This mirroring reflects the idea that school has as its main mission to prepare students for life beyond school (for more on this, watch Sir Ken Robinson tell it like it is here). Somewhere, though, the breadth and scope of the CCCs as laid out in the original QEP was reduced to just these four: Exercises critical judgment, Organizes his/her work, Communicates effectively and Works in a team, with only any two to be reported on, in a cursory fashion. The Partnership works at the state level to help states integrate Common Core (the 3R’s) and the 21st century skills (the 4C’s). The point of the Partnership is to ensure that students in American schools are developing the skills demanded of our world, not only as it is today, but as it is shaping up to be in the future. 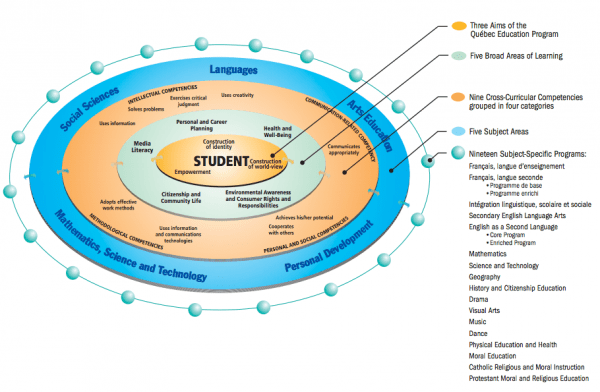 Closer to home, Alberta published their Framework for Student Learning in 2011, a document that outlines the core of their curriculum redesign. Note the date – over ten years AFTER the competency-based QEP. 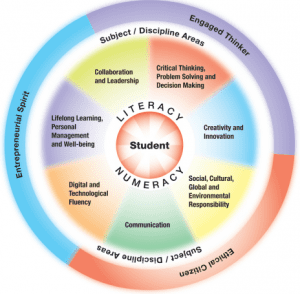 Their core competencies are also central to their curriculum, occupying the space immediately after the foundations of literacy and numeracy. In a nutshell, the Cross Curricular Competencies (CCCs) are those competencies that actually allow people to be successful in their lives, no matter what their chosen career path. And, by happy coincidence, the CCC’s also allow people to be successful at school! Are there any good reasons why they shouldn’t be front and center in our curricula? A teacher once told me “But we already DO all that, when we teach our subjects”. My answer is: but do the students know you are doing it? When we assume that learners will acquire CCCs by osmosis, we are truly engaging in mass delusion. I think that it is important to address CCCs explicitly with students, showing them HOW to break down a problem, HOW to forge new pathways, HOW to navigate group dynamics, HOW to get one’s message across clearly and effectively (among many others). By making the CCCs explicit for learners, we can help them be successful at school and beyond. And unlike some of what we teach in our classes, it is easy to link the CCCs to the students’ immediate lives and concerns and make it obvious WHY we are working on them. It is difficult to argue with the validity of making life skills explicit as part of schooling. The Cross-Curricular Competencies still form part of the core of the Quebec Education Programme, and this programme, in its original form, remains holistic and visionary. 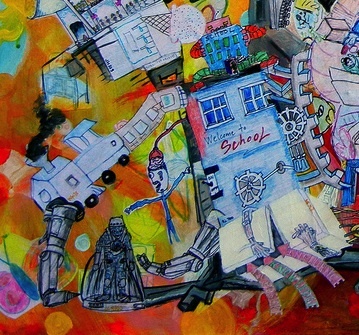 But somewhere along the way, our attention has been diverted from the Big Picture of the Purpose and Future of Schooling to smaller and somewhat reactionary snapshots of school as it once was. The devaluing of the CCCs has been the price paid for this change in focus. As the pendulum swings, I’m hoping we finally achieve the balance that our students need. Inspiring piece Sylwia! One of the reasons we, as a society, have shied away from the CCCs seems demagogic to me. Politicians, wanting to please parents (to which these were never explained clearly and wishing for a school they understand better) diminished the requirements over the years. But the basis of the QEP was to answer a truly deep and crucial need, which you describe clearly above: school must change to really support a different world and allow our students to learn more than the traditional skills and thrive in our new world. Thanks for writing this, the more we understand about the importance of these skills, the more we’ll all transform to help our kids develop them! Really enjoyed this article Sylwia. In my mind it speaks volumes to the need to connect education to the real world, which is complex and requires flexibility of thinking, and to the way the system keeps trying to tie things down. I also really liked the points about how students need to be aware of their CCCs, which seems a more likely way skills in school will become transferable to situations outside of school. It is sad that these ultimate goals of education seem to be so often forgotten. Thanks for helping us remember!